Title: Supply Chain Management in Business Success. Advancement in technology has played a major role in the success of businesses in the U.S. The internet in particular has played a major role in increasing the output and returns of companies selling goods and providing services all across the country. With globalization, escalating competition, geographical scope and complexity in the business environment has necessitated the continued improvements in the way technology is incorporated in businesses, both private and government owned. Many companies in developed countries have been forced to adapt to the area of supply chain management has not escaped the proliferation of technological innovation. According to Cagliano, Caniato and Spina (2005), supply chain management is described as the broadened focus of management that emphasizes the combined implications of the stakeholders involved in the production of services and goods, including suppliers, manufacturers, wholesalers, retailers, and the final consumer. In this understanding of the management of production and logistics networks, conviction is that all the participants in the process of delivering goods to consumers form part of a pipeline, network, or a supply chain. 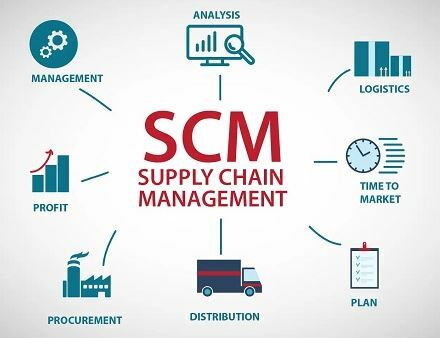 Supply chain management can, therefore, be understood as encompassing everything needed for customer satisfaction, including the determination of the products that consumer prefer, how to produce such products, and how to deliver them to the final consumer. The aim here is to ensure that the consumers receive the right products at the appropriate time, in the desired location, and at a friendly price. Electronic mail and the internet have revolutionized the communication and data exchange process, supporting the required flow of information between firms in the supply chain. The present paper explores the impact of the internet on supply chain management with particular focus on order processing, customer service, transportation, managing vendor relations, inventory management, purchasing and procurement, and production scheduling. An important premise informing the philosophy of supply chain management is the consideration of the network of processes, facilities, and individuals that procure raw materials, convert them into finished products, and eventually circulate them to the consumer as an integrated chain, instead of a collection of separate, but rather interconnected, tasks (Wisner, Leong & Tan 2005). This integration of the supply chain is important since the links of the chain are essential in achieving the goal of customer satisfaction. As noted by Barratt and Rosdahl (2002), though every company may have a supply chain, not every company effectively manages its supply chain for the attainment of strategic advantage. By enabling and connecting procurement, inventory management, order processing, transportation, production scheduling, and customer service, not only reduces costs associated with managing the supply chain, but also increases the efficiency of the entire process. Streamlining the entire process of supply chain management with internet technology requires a good understanding of the vital business processes involved in supply chain management and the appropriate technological solution for handling the complex flow of information, human resource management and material flow. The application of internet technology in the management of procurement is gradually developed in the recent past, with various studies indicating various applications of the internet in procurement processes, including communication with vendors, confirmation and comparison of vendor price quotes, and conducting purchases from the catalogs of the vendor (Croom 2000). An example of a company that uses the internet is General Electric, which reported reduced costs of procurement due online purchasing from vendor catalogs (Auramo, Kauremaa & Tanskanen 2005). By enabling purchases and negotiation from the vendor’s website at any time, the internet helps the company transcend the geographical restrictions that often characterized traditional procurement. As shown by Gunasekaran and Ngai (2004), one of the benefits of using the internet in procurement is the reduced paperwork flows, and reduced time taken from the time the order is placed to the time the products are delivered to the company. In addition, the internet also streamlines the process of vendor negotiation by introducing and online form of negotiation that is more effective and efficient than face to face negotiation. Such negotiations include bargaining, price agreements, renegotiation, and term agreements. Price negotiation is particularly improved by the internet since there is room for comparing different offers from vendors (Croxton et al. 2001). Another area where the internet supports procurement is by lowering the costs associated with handling returned or damaged goods enhancing the tracking of goods and by enabling notification by vendors before damaged goods can be shipped (Barratt & Rosdahl 2002; Gunasekaran & Ngai 2004). Other procurement issues handled through the internet include warranty issues and credits posted by vendors. Despite the improved efficiency, competitive sourcing opportunities and inter-organizational coordination of the procurement process due to the use of the internet, it is important to note that the adoption of an e-procurement strategy is considerably complicated. Consequently, Boyer and Olson (2002) advise that the challenges in implementing e-procurement can be mitigated through the adoption of an effective e-procurement strategy, setting and managing realistic managing expectations, and engineering procurement processes. Another problem in the e-procurement process concerns the verification of the credibility of the vendor. As shown by Auramo, Kauremaa and Tanskanen (2005), it can be challenging to determining the credibility of a company over the internet, leaving room for fraud and cons. Measures should be taken, therefore, to determine the credibility of a company before any business can be conducted over the internet. One of the most essential and significantly costly elements of the supply chain involves the management of inventory (Wisner, Leong & Tan 2005). Studies have also shown that lack of proper information flow in the process of inventory management can cause inventory buffers and inefficiencies in the management of the supply chain. Consequently, to keep inventory levels low and lower the overall costs of holding, while still offering high quality service to the customers is a significant challenge in strategic inventory management. To mitigate such challenges, internet-enabled inventory management enables processes that can be used to reduce costs without compromising the quality of customer service (Kevin Chiang & Monahan 2005; Cagliano, Caniato & Spina 2005). For instance, the internet can be used in inventory management for the notification of stock-outs offered by companies to their clients, or even the communication of stock-outs made by clients to vendors. The internet also enables companies to quickly implement electronic data interchange (EDI) information systems with their customers throughout the world. In inventory management, EDI is understood as the electronic exchange of information between the information technology systems of two or more organizations (Boyer & Olson 2002). With the help of the internet, EDI technology can be used to process order entry, order changes, order confirmation, pre-shipment notices, and invoicing. Through internet-based EDI, companies like Wal-Mart and Target realize success in the retail industry by quickly exchanging information with their suppliers, which would normally take long periods of data entry. The internet also positively influences the ability of companies to proactively manage their inventory systems. For instance, using the internet, a company can track out-of-stock inventory items and ensure that customers are notified in case of order shipping delays and any inventory emergencies. The improved inventory management also enables the company to replenish the inventory without delays. Tracking of items in an efficient and timely manner is also enabled by the internet by integrating various technological applications such as communication technologies, radio frequency technology and the internet. Identification In addition, inventory information needed for informed decision-making can also be made available to the decision-makers in good time. Other areas of importance of internet technology in strategic supply chain management are in customer service and order processing. For instance, using the internet to place orders has been found to streamline the process of quotation and result in reduced overall costs by enabling order placement and checking of order status as well as improved speed of processing. In this regard, reduced paperwork in the order processing not only saves time, but also lowers costs. With regards to customer service, the internet enables improved communication between the customer and the vendor, thereby improving awareness of customer needs and preferences, and enabling the tailoring of products to meet customer needs. It also offers a platform for the customer to communicate concerns and suggestions. Ultimately, through improved customer service, the internet enables the company to build a strong customer loyalty for its products and services. With the rapidly increasing use of the internet in supply chain management, it is increasingly important for managers to leverage the benefits of the internet for competitive edge. It is important for the supply chain manager to react quickly to information and adjust inventory, transportation and production to ensure cost efficiency and quality of service. It is important to note that the information provided over the internet is only useful if it is delivered in a timely and comprehensible manner. One implication on management concerns the dynamic pricing strategies enabled by the internet. As indicate by Keskinocak and Tayur 2001, the internet has altered the way goods are marketed and sold, and influences pricing. Supply chain managers can leverage the ability of the internet to offer flexible and dynamic pricing through online auctions and negotiation (Bapna, Goes & Gupta 2003). In addition, the internet offers collaboration of different components of the supply chain which can be leveraged to smooth the flow of products and information. This is important since collaboration between enterprises has been shown to be a considerable challenge to effective supply chain management (Lewis & Talalayevsky 2004). Leveraging the potential of the internet offers the supply chain management accessibility and standards that enable the integration and transmission of data across the supply chain components (Bartezzaghi & Ronchi 2004). An important consideration for management is that the supply chain collaboration is enabled through information sharing, creation of supply chain communities, and coordinating plans. These must be invested in and effectively implemented for an effective supply chain. Another important managerial factor concerning the internet and supply chain management is supply chain visibility, which is linked to reduction of the bullwhip effect. According to Jap and Mohr (2002), supply chain visibility implies to offering each level of the supply chain with accurate and complete information on customer needs and inventory levels, production levels, fulfillment needs, and shipment status. Managers need to understand that visibility reduces the bullwhip effect since if information on demand is shared, the actual customer demand data can be used to generate accurate forecast instead of depending on orders obtained from the previous stage. In addition, visibility of the supply chain enables the various components of the supply chain to coordinate production and distribution more effectively, subsequently reducing costs and lead times (Bartezzaghi & Ronchi 2004). The important implication here is to ensure that the information is accessible to all partners in the supply chain and in a format that can enable business decision-making. Managers also need to invest in tools that enable the visualization, plan and make decisions based on large databases. Essentially, the proliferation of technology and the internet in business cannot be avoided. Ultimately, there is need to protect the data obtained and transmitted over the internet from fraudsters and identity thieves (Ngai & Gunasekaran 2004). Given the numerous benefits linked to the use of the internet in supply chain management, proper structures need to be developed for companies to leverage the potential of the internet. The present analysis examined the role of the internet in effective supply chain management. From the analysis it is evident that the internet can offer supply chain management the benefits of reduced costs, improved customer service, enhanced procurement and order processing, as well as collaboration and visibility throughout the supply chain. It is also apparent that the internet enables partners in the supply chain to collaborate in order to improve planning and forecasting. Other benefits include improved customer service, data sharing, and product flow. However, information sharing has various technological, legal and commitment implications, requiring observation of certain principles and goodwill from organizations. It is also important for organizations to adopt measures to protect the information obtained and shared over the internet. Ultimately, though the internet offers an important tool for improving the effectiveness of supply chains, security and management concerns must be addressed for the optimal benefits to be realized. Auramo, J, Kauremaa, J & Tanskanen, K 2005, “Benefits of IT in supply chain management: An explorative study of progressive companies”, International Journal of Physical Distribution & Logistics Management, vol. 35, no. 2, pp. 82-100. Bapna, R, Goes, P & Gupta, A 2003, “Analysis and design of business-to-consumer online auctions”, Management Science, vol. 49, no. 1, pp. 85-101. Barratt, M & Rosdahl, K 2002, “Exploring business-to-business market sites”, European Journal of Purchasing & Supply Management, vol. 8, no. 2, pp. 111-122. Bartezzaghi, E & Ronchi, S 2004, “A portfolio approach in the e-purchasing of materials”, Journal of Purchasing and Supply Management, vol. 10, no. 3, pp. 117-126. Boyer, K & Olson, J 2002, “Drivers of Internet purchasing success”, Production and Operations Management, vol. 11, no. 4, pp. 480-498. Cagliano, R, Caniato, F & Spina, G 2005, “E-business strategy: How companies are shaping their supply chain through the Internet”, International Journal of Operations & Production Management, vol. 25, no.12, pp. 1309-1327. Croom, S 2000, “The impact of web-based procurement on the management of operating resources supply”, The Journal of Supply Chain Management, vol. 36, no. 1, pp. 4-13. Croxton, K, García-Dastugue, S, Lambert, D & Rogers, D 2001, “The supply chain management processes”, The International Journal of Logistics Management, vol. 12, no. 2, pp. 13-36. Gunasekaran, A & Ngai, E 2004, “Virtual Supply-Chain Management.” Production Planning & Control, vol. 15, no. 6, pp. 584–595. Jap, S & Mohr, J 2002, “Leveraging internet technologies in B2B relationships,” California Management Review, vol. 44, no. 4, pp. 24-38. Kehoe, D & Boughton, N 2001, “Internet based supply chain management: A Classification of approaches to manufacturing planning and control.” International Journal of Operations & Production Management, vol. 21, no. 4, pp. 516-524. Keskinocak, P & Tayur, R 2001, “Quantitative analysis for Internet-enabled supply chains,” Interfaces, vol. 31, no. 2, pp. 70-89. Kevin Chiang, W & Monahan, G 2005, “Managing inventories in a two-echelon dual-channel supply chain,” European Journal of Operational Research, vol. 162, no. 2, pp. 325-341. Lewis, I & Talalayevsky, A 2004, “Improving the inter-organizational supply chain through optimization of information flows,” Journal of Enterprise Information Management, vol. 17, no. 3, pp. 229 – 237. Ngai, E & Gunasekaran, A 2004, “Information systems in supply chain integration and management,” European Journal of Operational Research, vol. 159, no. 2, pp. 269-295. Wisner, J, Leong, K & Tan, K 2005, Principles of supply chain management: A balanced approach. Thomson South-Western, Mason, OH. Did you find any useful knowledge relating to Supply Chain Management in Business Success in this post? What are the key facts that grabbed your attention? Let us know in the comments. Thank you.